Alarm bells are ringing in China as Beijing continues its relentless crackdown on shadow banking. 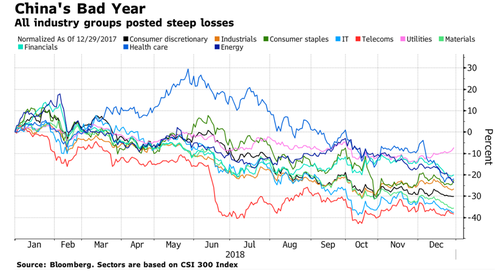 Hundreds of Chinese companies issued profit warnings, telling their investors that earnings for the full year were going to be below expectations, according to Bloomberg. No less than 440 zombie companies disclosed the bad news on Wednesday, still one day before the deadline for such disclosures. 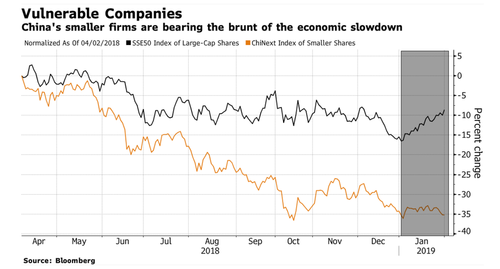 The companies cited the country's economic slowdown (which is also catalyzing sales of Chinese-held U.S. real estate), as well as recent accounting changes that followed a $2.3 trillion equity market selloff last year. The change is stunning: out of more than 2400 mainland listed companies, 373 have said they're going to post a loss - and what's more concerning, 86% of those companies were profitable in 2017. There may be more bad news on the way: Thursday is the official deadline for companies to disclose whether or not they expect "substantial changes" in their financial results, so expect even more guidance cuts. Meanwhile, fears about China's economy, and corporate profitability in a time of record bankruptcies now that the government is no longer backstopping every corporation, has become a collective concern among market participants. Lv Changshun, a money manager at Beijing Dajun Zhimeng Investment Management Co., told Bloomberg: "Private companies are particularly vulnerable to the economic downturn. 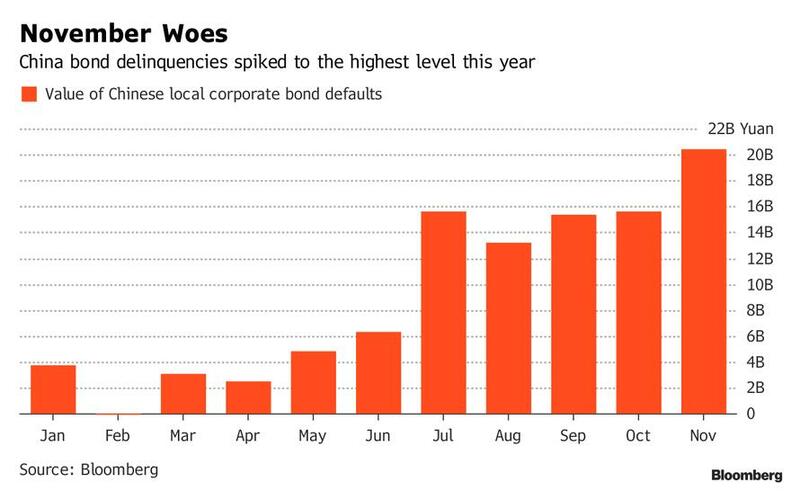 The deleveraging campaign and the deterioration of their corporate health is normal for any economy that is shifting gears and slowing down." Among those issuing the concerning guidance are companies like Ford's biggest partner in China, Changan which warned that 2018 profit was likely going to tumble 93%. China Life, a massive insurer by market share in China, said its net income could be lower by 70%. Beijing HualuBaina Film & TV Co., cloud-storage operator Gosun Holding Co. and First Tractor Co. also all said they'd post billions of yuan in losses for the year after having profitable 2017s. Anhui Shengyun Environment Protection Group Co. and Anhui Ankai Automobile Co. disclosed that their net losses would be twice as big as they were in 2017. Guangdong Homa Appliances Co. was halted limit down during Wednesday trading after guiding for a loss in 2018 after stating just months ago that they'd be profitable. And since profit warnings in China - where companies notoriously misrepresent the rosy state of their finances (recall that one week ago, a Chinese company which filed for bankruptcy, reported that it "had" 15 times more cash than due debt yet it couldn't meet its debt obligations) tend to be an early warning for liquidity problems, or worse, insolvency, the bond market has also felt aftershocks. The bonds of Chinese furniture maker Yihua Lifestyle Technology Co.’s fell to less than half of par. Air conditioning producer Zhejiang Dun’an Artificial Environment Co. has been put on a negative watch Chinese credit agency China Lianhe Credit Rating Co.
One reason why China's companies are suddenly "coming clean" was suggested by Qi He, a fund manager at Huatai Pinebridge Fund Management, who said that "companies whose shares are already quite battered have nothing to lose by lowering earnings forecasts or taking large impairments for 2018. Many of these companies are actually ‘taking a bath’ to begin anew in 2019." Meanwhile, others are understandably worried that it's only going to get worse: Yu Dingheng, a fund manager at Shenzhen Flying Tiger Investment & Management Ltd. said: "we’re only just seeing the beginning of deterioration in corporate earnings as the economy slows further. Things will continue to go downhill for firms seeing business slowing and even as the macro-economy recovers, these individual firms will never be what they were." ... all eyes were on last week's avalanche of Chinese economic data. The Q3 bounce in macro data was extremely weak. 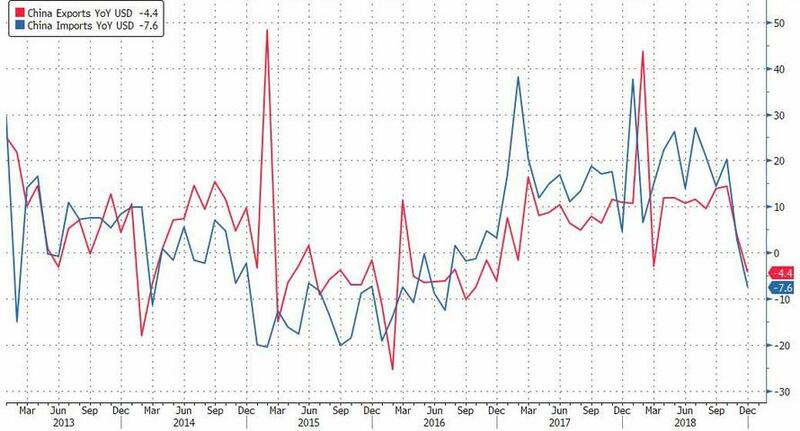 We reported just last week that China's 2018 GDP growth had slowed significantly. China's annual GDP growth in 2018 was +6.6% - the weakest annual GDP growth since 1990. Which is why as Rabobank's Michael Every said earlier today "That Chinese stimulus had better arrive soon..."